In Austria currently 25,500 beekeepers are managing about 380,000 bee colonies. 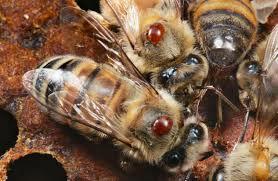 Pesticides in agriculture and climatic changes and most of all the introduction of the Varroa mite confront beekeepers in Europe and North America with increasingly difficult challenges. Only with a regular Varroa mite diagnosis and combat it is possible to ensure the survival of the bees and the pollination of crops and natural biodiversity. Current counting methods are invasive, time-consuming, and what is more, unreliable. 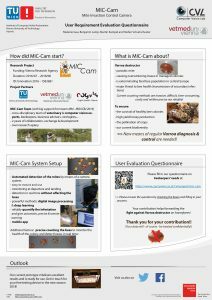 In the project MIC-Cam a system for the automated detection of mites is developed monitoring the bees by camera when departing and landing at the flight board to recognise attached mites in real time without restricting the bees. We apply innovative methods of digital image processing and machine learning implemented on single board processors for a robust and real-time detection of mites in the image sequences. Thus, an exposure profile of a colony can be created automatically in order to be able to initiate timely measures for a mite-killing treatment. Schurischuster S., Remeseiro B., Radeva P., and Kampel M. “A preliminary study of image analysis for parasite detection on honey bees”. In Proceedings of the 15th International Conference on Image Analysis and Recognition (ICIAR 2018), 2018.